Green Hope-Rise Field is a brand specializing in LED products, including LED shoes, LED caps, LED T-shirts, LED shoelace and so on. Size Chart: 6.5 D(M) US Men = EU size 39 = Fit foot length 243mm/9.33in 7.5 D(M) US Men = EU size 40 = Fit foot length 250mm/9.56in 8 D(M) US Men = EU size 41 = Fit foot length 257mm/9.84in 9 D(M) US Men = EU size 42 =Fit foot length 263mm/10.35in 10 D(M) US Men = EU size 43 = Fit foot length 270mm/10.62in 11 D(M) US Men = EU size 44 =Fit foot length 277mm/10.90in 12 D(M) US Men = EU size 45 =Fit foot length 283mm/11.18in Warm Tips: 1. 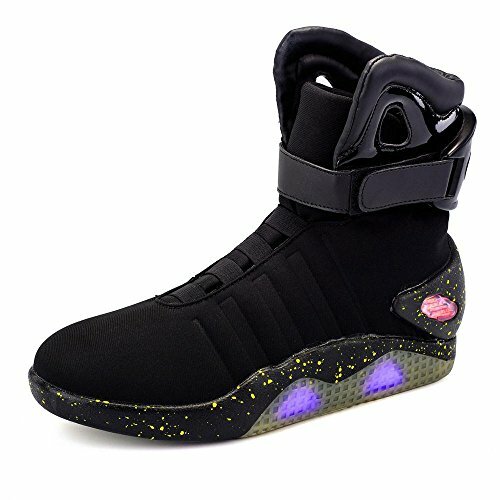 Thanks for your choice on our products, shoes light up just like in the movie: Back to the Future II your customer reviews and positive feedback would be much appreciated! 2. Our purpose: QUALITY WIN, offer FREE EXCHANGE and REFUND if any problems, please contact us freely, we would reply within 24 hours. 3. LED Shoes are suitable for casual walking, dancing and daily wear, not suitable for athletic sports in order to make sure the light system in good condition all the time. 4. 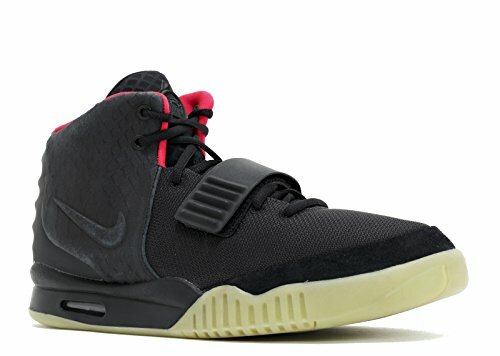 Please charge the shoes first when you receive them to make sure the enough power to light up. Any problems please feel free to contact us. 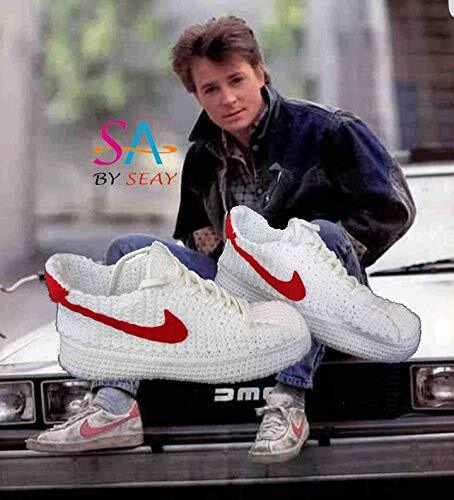 *********Back to the Future Knitted Slippers*********** *Everybody loves Marty McFly and Doc. 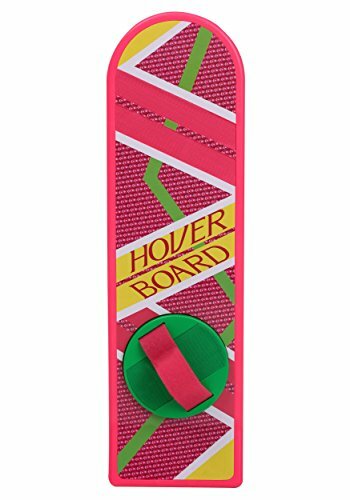 *Back to the Future comes to your home. 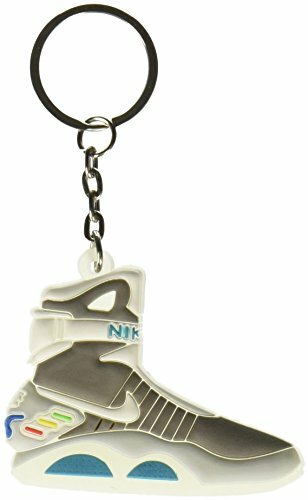 *Marty McFly slippers for your feet. Warm and comfy feet with the flying Marty McFly's. In Back to the Future, Marty Mcfly wears a pair of low top Bruins. The old vintage ones are hard to come by. Luckily I made this model a knitting style. 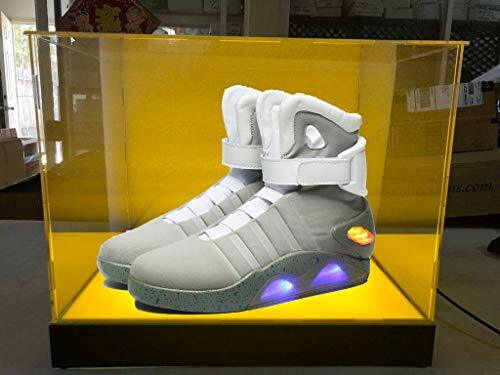 While they mightn't be as memorable as the Mags, Marty's pair of white and red Bruins these sneakers can be a very popular shoe and gift for BTTF collectors. 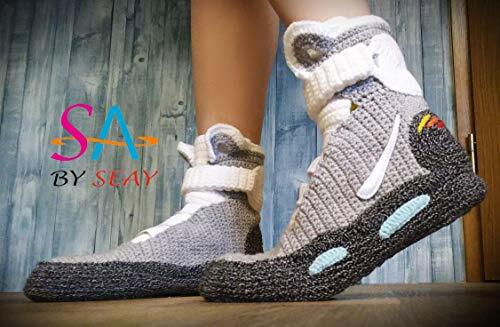 You were looking for a unique and softer version for use around the house, you might want to check out the soft knitted slipper version of the famous Back To the Future shoes. ****The non-slip EVA soles make sure that your feet are protected from the cold floors. The White eva insoles is a creative invention which I use the soles under the crochet slippers to protect them. The eva insoles the soles against dirt, dust, wear and tear. It's just wonderful to walk on slippery floors also. Now you can roam your house looking stylish as ever while still remaining warm and cozy. If you need another size or color, please contact me. All adult sizes as well as the children and baby ones can be custom knitted for you. We wish good shopping. 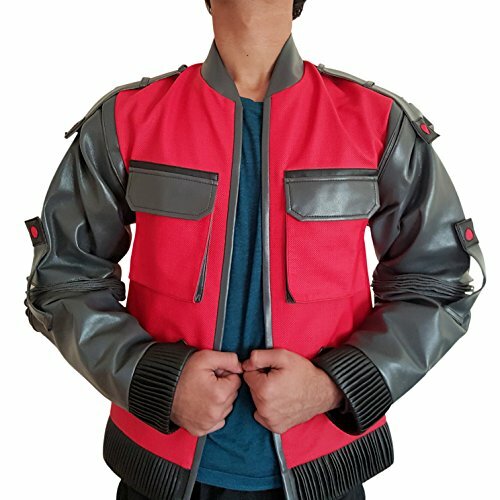 Brand New, Back to the future Jacket have good quality polyester lining and inside one pocket,. It also has a One inside pocket. Inside Poleyster lining. Front Zipper-Closure.